What was the lasting impact of the 1960s on American politics and media? On October 30 the Steven Kasher Gallery in Chelsea will open the exhibition David Fenton: Eye of the Revolution, a look back at Yippies, Black Panthers, Be-Ins, Weatherman, the Chicago 7,tear gas, protests, and the years that changed America forever. 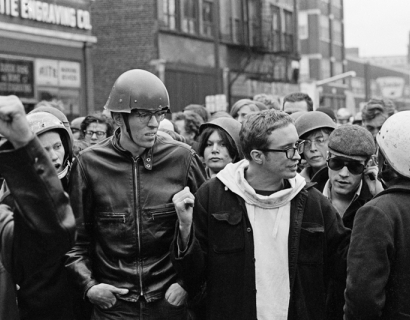 In conjunction with the exhibition, the Gallery will also host a pair of panel discussions on the legacy of 1968-69, featuring former Chicago 7 defendant Tom Hayden, SDS Weatherman leader Bernardine Dohrn, and others, on Saturday, November 8. Details to be announced. Still in his teens in the late 60s, underground news photographer David Fenton – now CEO of a major public interest communications firm – photographed the passionate street protest and calculated mass media tactics that still shape U.S. politics and culture today. His photos appeared in anti-war and counter-cultural publications around the world, as well as in The New York Times, Life, Look, Newsweek and many others. Fenton possessed both a police press pass and behind-the-scenes access to the leaders and celebrities of the era. 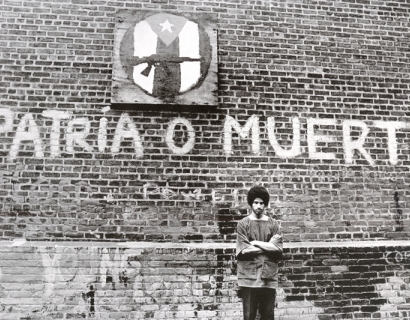 Eye of the Revolution will feature over 75 photographs, including rare vintage prints. Join Fenton on a countercultural journey from Washington, D.C. to New York City, Oakland and Chicago with stops at Columbia, Yale and Berkeley looking at Civil Rights, the Peace Movement, Black Power, Women’s Liberation, Gay Rights, Hippies, Police Riots, Yippies. Abbie Hoffman, Jerry Rubin, Bobby Seale, Huey P. Newton, Allen Ginsberg, John and Yoko, Black Panther leader Fred Hampton, Weathermen Bill Ayers and Bernardine Dohrn, and the pig who ran for President. Since his employment at Liberation News Service – which paid him $25 a week in 1969 – Fenton’s protest- driven view of the world has evolved into Fenton Communications, the nation’s largest progressive communications firm. With clients including MoveOn.org and Nelson Mandela, he is still pushing for change in the tradition of 40 years ago. The two panel discussion on November 8 will examine the negative and positive legacies of 1968/69, and the evolution of alternative media then and now. Tom Hayden and Bernadine Dohrn will appear on the first panel, with others to be announced shortly. David Fenton: Eye of the Revolution will be on view October 30 through November 26, 2008. For more info or press requests please contact Sarah Bacon at 212 584 5000 x318 orsbacon@fenton.com or Kat Jones at 212 966 3978 or kat@stevenkasher.com.